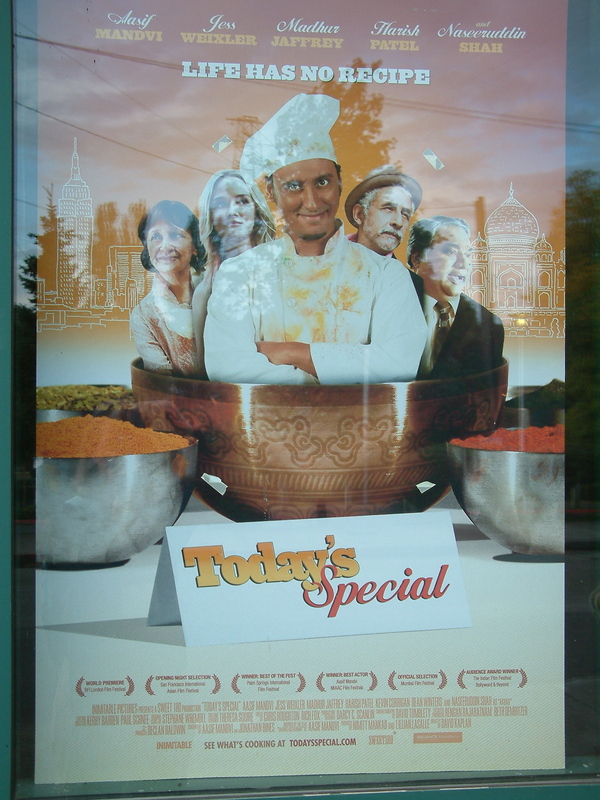 For all those indie, foodie folks out there watch for local listings so you can get a serving of feel-good vibes from “Today’s Special,” a new movie by David Kaplan to be released Nov. 19, 2010. Samir (Aasif Mandvi, The Daily Show with Jon Stewart and “The Last Airbender“) is a sous chef who is gunning for head chef at an upscale Manhattan restaurant. He loses out to someone younger and less experienced who outshines Samir with charisma. Samir’s crisis in identity and career coincides with his father’s health scare and Samir is suddenly tasked with keeping the day-to-day operations of the family’s ailing Indian restaurant, Tandoori Palace. His mother, Farrida, (played by legendary cookbook writer and actor, Madhur Jaffrey), complicates every scene with her quest to find a wife for Samir, her only living child. Enter Akbar, a taxi driver, passionate chef, and, apparently, guardian angle. (Akbar is played by Bollywood favorite Naseeruddin Shah of “Monsoon Wedding.”) Akbar helps to temper Samir’s frustrations and channel his talents into remaking Tandoori Palace from a dump into a stylish and enticing eatery. If you love a good “makeover” story, “Today’s Special” delivers nicely. There is a lot to appreciate about “Today’s Special,” even if the 90-minute plot is simple. Samir’s family is Muslim and as lovably neurotic as any other normal New York City family. And there are some tender lessons about forgiveness, loving your past, and embracing present good — even if it doesn’t quite look the way you had hoped. There are no unexpected surprises in “Today’s Special,” but sometimes it’s fine to get exactly what you ordered. Make sure you know where the closest Indian restaurant is to your theater, however, because as soon as the lights flicker on, you’ll want some puffy, hot naan and spicy murg chicken. And maybe a date with Mr. Mandvi. This movie was screened at the International Food Blogger Conference in Seattle. I wish I could have stuck around for the movie at the IFBC. It sounds like a fun flick, and definitely one to watch while snacking on Indian food! I love your blog. Great pictures. I was supposed to have gone to the IFBC – but we had a family emergency. It looked like it was such an incredible time. I could go for some of that great Indian food we had right now!